This project is a token of appreciation for a small yet significant kindness given to me. Offering something in return to convey my gratitude properly, meant it needed to represent something close to the heart. From employees and family of my unsuspecting “client”, I received the unanimous hint that trips to the Florida Keys and the adventures of catch-release Tarpon fishing were not only special outings, but also provided respite from a stressful profession. This appealed to me greatly, since his gift had provided me with a peace of mind I had long sought. My research on Tarpon provided endless amounts of images of these beautiful fish that resembled nothing less than mirrors, their enormous mouths wide as windsocks when hooked. While above water, they are solitary figures, the focus of everyone’s attention in the excitement of the catch. The views from below the surface, swimming in the cool crystal waters, conveyed the feeling of serenity I sought. There they swim in tight clusters with their comrades, sleek as bullets, their mouths now elegantly folded. The rigid and soft sections around their mouths create an intriguing surface, a maze of lines giving you hints of the mechanics beneath. I needed to stay up close to observe these detailed patterns, but also wanted to pull back to in order to appreciate their silhouette with the distinctive assortment fins. 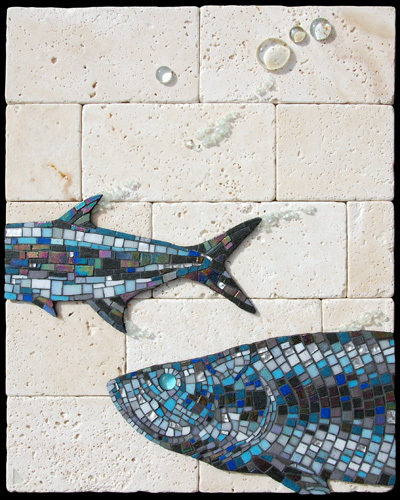 My personal fond memories of the Florida Keys became instrumental in the selection of the materials used on this piece. Those materials are not literal representations, but rather triggers for my experiences in the Keys. The mirrored bodies of the fish reflect the colors of the waters, from the brilliant aqua of the surface to the rich blue of the mysterious depths. The light travertine reminded me of the corals and bleached white of all that surrounds you. The transparent glass conjures sparkling waters, the refreshing icy spray in the heat of the day. “One fish two fish” was truly an evolution rather than a plan. It was such a pleasure to bring about, I might have to reflect some more again ... perhaps in Red?